The Sisters Grey are warriors, sworn to protect their Kaiser. But as great war rages, the Kaiser is found dead, and one sister - Giselle Grey - is accused of murder. Persued by enemies, Giselle must unravel the prophecy of the Carbon Grey - before history itself unravels. 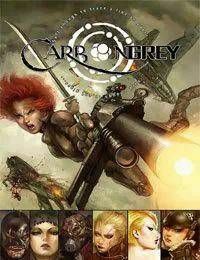 This collection includes all three volumes of the epic saga, stories from CARBON GREY: ORIGINS, and a new ten-page prologue.